It’s usually so oppressively hot here I can’t wait for summer to end and experience that first delicious chill in the air. …Except we’ve had a chill in the air quite a few times this summer and now it’s slipping away all too quickly. Oh, our garden is still producing zucchini and tomatoes–and at times it’s been a burden figuring out ways to use all the zucchini. Now that’s it’s getting into late August, I’m appreciating more and more any produce our garden decides to give us. This casual, yet elegant Provencal vegetable tian (pronounced “tyan”) adapted from Ina Garten’s Barefoot in Paris is the perfect way to use up those late-summer gifts from the garden. I love Ina’s recipes; they’re clean, easy, are well-tested and simply fabulous! A tian describes the shallow (generally earthenware) baking dish along with the food that is cooked inside it. The vegetables cook in their own juices; no other liquid is usually required except perhaps a slight drizzle of olive oil. If using peak-of-summer tomatoes, I found adding more liquid won’t be necessary. The vegetables in tians are interchangeable but are generally Mediterranean-style. Yellow squash may be used instead of zucchini, eggplant instead of potatoes or red bell pepper in place of some of the onion. Mushrooms are also a possibility — use your imagination! Any shallow baking dish such as a 9 x 13-inch baking dish or gratin will work. Arrange the vegetables in individual baking dishes and this dish will be the hit of your next dinner party. Because this vegetable tian includes potatoes, it makes a substantial side dish for simply roasted meat, poultry or grilled fish. It also makes a hearty entrée for the vegetarian friend who comes to dinner. To make the tian ahead, assemble, bake until the potatoes are tender, cool, and store up to two days. When needed, heat in the oven loosely covered with aluminum foil until hot. Then, proceed with adding the remaining cheese and lightly browning the top. I don’t recommend storing fully assembled without baking–the potatoes will discolor. Tucking the potatoes in at the last minute is also an option. This recipe calls for Gruyère cheese which is on the pricey side, but almost any white cheese that can be shredded — such as mozzarella or Swiss — will work. The tian will be wonderfully juicy and bubbling when you remove it from the oven. Let it rest a bit before serving. 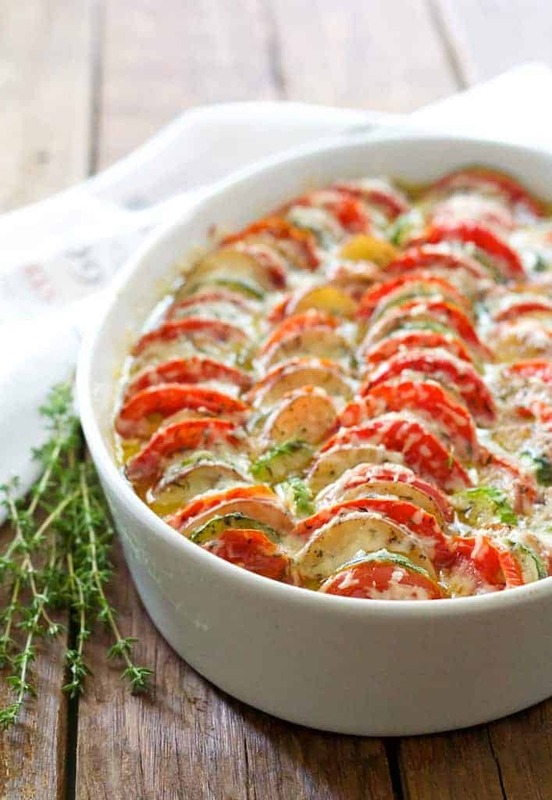 Late Summer Vegetable Tian is a beautiful Provencal-inspired dish! Brush a large, shallow baking dish with olive oil. In a large sauté pan, heat olive oil over medium-high heat. Add the onion and cook 15 to 18 minutes or until almost golden. Add the garlic and cook 1 to 2 more minutes. Add half the thyme and salt and black pepper to taste. Drain off any excess oil. Transfer to the prepared baking dish and allow to cool while preparing the vegetables. Sprinkle half the cheese over onions. Slice the zucchini, tomatoes and potatoes into 1/4-inch slices. While the vegetables are on your cutting board, sprinkle with salt and black pepper. Layer vegetables alternately in the dish on top of the onions and cheese, fitting tightly to make one layer. If any vegetables are left over, tuck them in anywhere to use every last one. Once they're arranged, sprinkle with more salt, black pepper and remaining thyme. Cover the dish with aluminum foil and bake 45 to 50 minutes or until potatoes are tender. Uncover, sprinkle with remaining cheese and and bake another 10 to 12 minutes or until cheese is lightly browned. Allow to rest 10 to 15 minutes before serving. What cheese would you recommend for heart healthy diet? We are experimenting with new veg recipes and this looks awesome! Hi, Jo, Cheese is pretty much heart-healthy ends. You could use a reduced-fat 2% cheese. I don’t recommend fat-free cheese, it’s like putting plastic in your food. Also, another option is to use less of a really good, nutty cheese such as Parmesan, Asiago or the Gruyere. Thanks so much and great to hear from you!! I made this vegetable tian for a dinner party and my guests raved! Even my kids beg for it over and over. It’s a no fail recipe! Thanks so much, Anne! So glad it worked out so well for you and that you all enjoyed! Great presentation (until you scoop into it), taste was good. I was shocked at how much liquid was in the bottom of the pan (I used glass). I’m sure resting longer would help a little, or maybe cooking it for a bit without the foil, but sheesh. Did I not use enough salt on the veggies? Was it from the tomatoes? Plus onions were no where to be found – did they liquefy? Was it oil from the cheese? Thanks for your feedback! I just checked Ina’s recipe which was the one I adapted– https://www.foodnetwork.com/recipes/ina-garten/vegetable-tian-recipe-1943236 –and reviews are mixed. We’ve always enjoyed this and I just made it for a personal chef customer last week. They love it and request it frequently. Ina does uncover sooner and then bakes it uncovered longer. Looks like I need to retest this recipe soon! Thanks again! I just made this. It was a disappointment. When I took it out of the oven I could see through the glass pan that the entire bottom half of the pan was filled with oil. I don’t know why it was so oily but I can only assume it was from the cheese. After it cooled for a little bit I managed to drain most of the oil. Aside from all the oil the dish was nothing to write home about. I would have been much better off just roasting those vegetables on a pan. Don’t waste your time on this one. Hi, Valerie, So sorry this did not work out for you! Ina Garten’s recipes are generally spot-on! I haven’t made this for myself recently but do make this frequently for a personal chef client of mine. They love it and it’s a favorite of one of their kids. It can get a bit “juicy” but haven’t noticed anything “oily” about it. I do let it rest before serving so the juices settle back and never drain them off because it’s draining off flavor. I take feedback from my readers very seriously. Thank you for your feedback and I plan to retest in the near future! Such a great idea and fun way to use those end of summer vegetables! Looks delicious! I’m obsessed with zucchini and try to eat it as much as I can during the Summer but it can get boring since I only know a few ways to make it. I can’t wait to try this so I can extend my zucchini season a little longer. The vegetables, the garlic, the cheese … I’m drooling over this recipe! What a perfect way to prepare seasonal vegetables. OK how gorgeous is THIS?! Love that you added gruyere to these veggies. Such a stunner! I’m with you – I love Ina’s recipes for all the same reasons! This tian looks especially lovely, above all with all of that garden fresh produce. Talk about making the most of these waning days of summer! Oh yummy! This looks like the perfect meal as we transition to the fall! Lovely vibrant colors! Your tian looks amazing! This looks super delicious and beautiful presentation. Am so tempted to try this one. Carol, I’m not a chef, merely a home cook. I notice that there are similarities between this dish and Ratatouille, a dish I’ve only made once, but we all loved. Like you, I’m getting produce from my garden with zucchini and tomatoes being the stars this year. I always have potatoes, so I’m definitely planning to make this. It’s almost too pretty to eat. I’m always so fascinated with veggies so beautifully layered. Looks so pretty and appetizing too! Gruyere Cheese sounds so delish. This looks gorgeous. I love it when you can pull fresh, yet simple ingredients and make something so wonderful and flavorful! Absolutely delicious Carol! 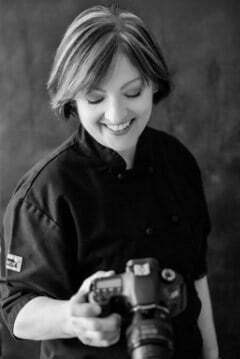 I enjoy your blog and recipes!! Gosh, your photos have me drooling! I love all the vibrant colors :). Gorgeous pictures and recipe! Your Vegetable tian looks wonderful! never made a tian before.. assumer its similar to a gratin? looks delicious, definitely need to try the recipe out.